As the library liaison for the School of Health Professions, Karen D. Barton serves as the single point of contact to help students, faculty and staff navigate the resources available at Briscoe Library and innovate ways to enhance learning. 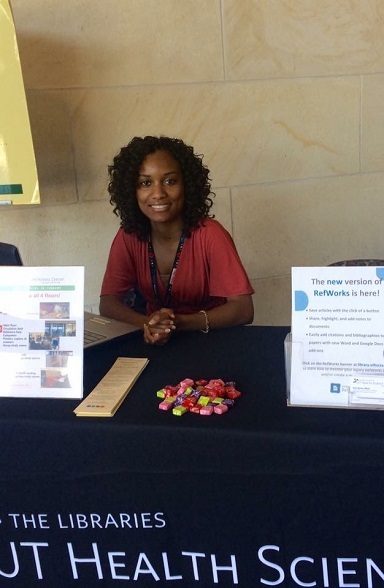 Barton’s office hours in the RAB lobby are Mondays from 12 p.m. to 1 p.m., and she also is available for one-on-one help, including student research project assistance. Barton works with SHP faculty to create LibGuides, an online resource of subject-specific guides containing information on databases, journals and other pertinent resources. LibGuides already online include those for evidence-based practice for Occupational Therapy and Physician Assistant Studies, as well as tips for successful poster presentations. Technology resources have expanded at the library, where staff is available to assist in 3D printing—something that will soon be available for independent use. The 3D printing is located in the new Briscoe Library Technology Sandbox, an open area on the main floor of the library designed to inspire exploration. The space features interactive work areas, a 75-inch monitor, and will soon offer an Oculus Rift virtual reality headset, which will allow faculty and students to explore anatomy in two exciting ways—through a virtual trip through the bloodstream and a virtual anatomy atlas. A newly formed student library committee will be weighing in on upcoming renovation plans at the library. Barton urges any interested students to contact her for more information on how to participate on the committee. “We definitely want students to give us their opinions,” she said. Barton also serves as a community engagement librarian, a role that takes her to both on and off campus events. Contact School of Health Professions’ library liaison Karen Barton at (210) 567-2428 or| BartonKD@uthscsa.edu. Visit the University’s library website for more information on services and resources.